For many years a malleable iron washer has been a common component in heavy timber and marine construction. With a large bearing surface and thick cast design they help prevent the bolt head or nut from pulling through wood connections. There are two common types of MIW. One style of malleable washer is produced in the United States, while the other is made overseas. The import option is readily available in the marketplace in sizes for bolts from 3/8″ to 1″ in diameter. It has one nail hole and two notches on the outer edge. The domestic washer is similar with two vertical slots on the outside edge, but is missing a nail hole. Both have similar inside and outside dimensions. According to the original patent from 1907 the outer notches were meant to lock the washer from turning against the wood. A chisel is used to bend the metal edge into the wood. To our knowledge, this installation process is rarely used. The keyhole is historically used to drive a nail or wedge in against the nut, to lock it into place and keep it from turning. Here is an original patent from 1904 for a similar washer that shows a keyhole and nail being used in this way. Over time, the features for both washers were combined into one washer with the features of both. @Mosikurosu- Our standard malleable washers are made per ASTM A47, ferritic malleable castings. Typically, the carbon is controlled in order to meet the required mechanical properties.If you are using these washers in an outdoor application, they will rust unless you protect them. Hot dip galvanizing is a common method for controlling corrosion. According to a 1904 patent I googled… “and after the nut is applied a suitable key 10, such asa nail or other suitable implement, can be driven through the eonstrieted portion 5 ot’ the opening, so as to cngag’e the side of the nut and prevent its turning’.” Sooo… If I decipher it correctly, it looks like the keyhole allows for a nail to driven right against the flat of a nut, to act as a lock. Do you know why the import bolt has a key hole in it? @Scott- I am sorry, we don’t know why. we have asked manufacturers, importers, and end users and no one has ever been able to give us the reason why. 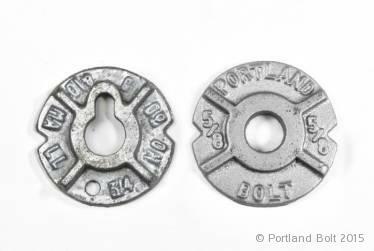 @Bascadog – As far as we are concerned, the bolt diameter is all we’d need to identify them. All the other dimensions are standard. There are however, other decorative and cast washers that are available like Ogee washers and Rosette washers.